Au Fil du Jardin: TIF and misc. Thank you Annica, Muum and Kylee for the comments on the socks. They were easy to make, and rather quick considering the size of the needles:-). As the yarn is variegated, it is a constant surprise. I've been working on the TIF, developping the idea of lavender and olive trees. I will use a mix of machine and hand embroidery. Here is the first part, with the machine embroidery done. Now I have to populate the trees by hand. we were motorcycling ( and breaking down) in Provence in September and I remember smelling the lavender from roadside stalls as we rode by. How beautiful to have olive and lavendar as part of the landscape where you live.Thanks for your thoughts on my creative dilema and sharing your own experience. You have captured the lines of the lavender fields, what memories!!! I look forward to the olive trees. It is coming along quite nice. I can't wait to see the additions to the trees. I can almost smell the lavender. What a creative way you chose to depict it. This looks great - I love lavender. My small bushes have survived our winters for several years now!! 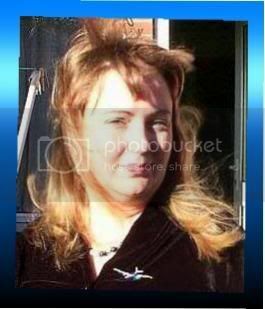 You've been "tagged" - by me! And you'll understand why when you visit me next time. 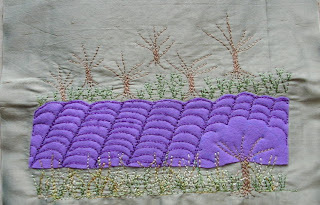 I just love lavender - and love the way you've quilted yours to make them look like waves. Absolutely beautiful! You are very talented.